Pivoting Toward Net Force Focused: A Day of Success – Teach. Brian. Teach. Thursday, in algebra-based physics, we pivoted away from the standard algorithms for solving forces problems and toward “Net Force focused” approaches. The point here was to get students oriented to thinking about Net Force in more concrete terms using “mental math”, and thinking about Newton’s 2nd Law in terms of how Net Force act on an object to cause acceleration (rather than a prompt to write down an algebra statements). Later in the day, students were solving problems with interacting objets. An elevator with two stacked crates (5 kg on top, 10 kg on bottom) was accelerating upward at 3 m/s/s. Students had to find the force between the crates. It made a whole lot more sense to students to say that the 5kg block needed a Net Force of 15N. Since the weight force pulls down at 50N, the upward force must be 65N to make the Net Force 15N. Similarly for the heavier block, although the reasoning is more subtle because you have to apply Newton’s 3rd law and contend with three forces instead of two. 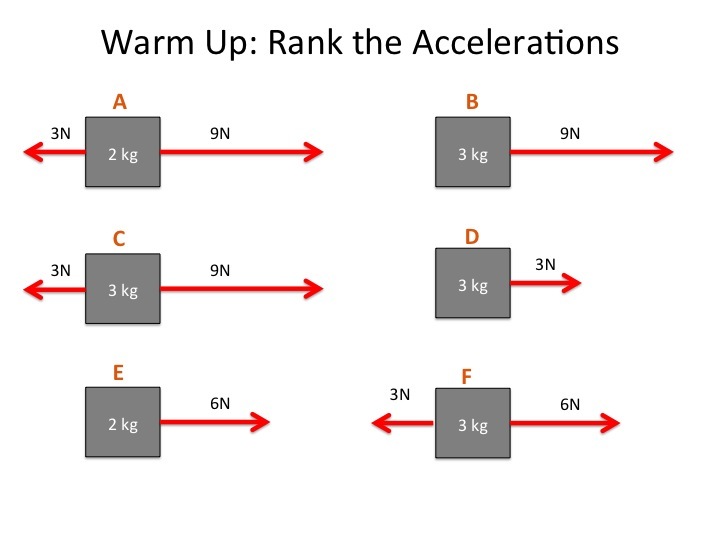 But students were able to get to the answer that if the heavier block is going to have a Net Force of 30N, their must be an upward for of 195N to counter the downward weight force of 100N and the downward force from the top crate of 65N. Some groups still took the more formal algebra-based approach, but as a class we compared and contrasted the two approaches, which seem to help students make sense of it even more. During discussion, we decided it was very helpful it is to actually draw the Fnet vector next to your freebody diagram. We also decided that after drawing free body diagrams with symbols, that we should label the value of forces (and/or net force) as we figure them out. So label the weight force w, but then write 50N next to it once you calculate that, etc. Same with Net Force Vector–once you have determined it’s 15N, you should write that next to your diagram. In this approach, we are using the free body diagrams to support our thinking about the force arithmetic, as opposed to in the standard algorithm where you use the free body diagram to support you in writing down algebra statements. 1. We are doing more “sense-making” about the physics rather than following algorithms. 2. We are using math skills that are (more) empowering for (more) students. 3. Students now see the diagram as useful (and have even suggested ways they could be more useful). A. A few groups when they calculate the Net Force… they are prone to want this to be one of the forces acting on the block. They might decide it’s a force, or they might ask, “Which force is 15N?” This is a confusion I’m happy to spend time on, since it’s about physics, not about Math. B. There are still quite a few students that struggle with mental math–it might take them several trials of guess and check to arrive at conclusion like… if there is 50N down and we need 15 N Net Force up to decide that the upward force must be 65N. This is math I also think is worth spending time on for these students, because if students’ number sense is like this, there is no point in doing crazy algebra. C. Of course groups needed support in drawing the FBDs; we actually paused mid-problem-solving to share and discuss. Multiple normal forces with stacked objects is very challenging for students. A few groups even wanted to say that the elevator pushed on the top block. This is where system schema would help, but students are supposed to “draw” the boundary around the object of interest, and identify contact forces by which objects are in contact. Most groups who made these mistakes didn’t take the time to draw the situation out, identify the boundaries, and explicitly think about it.